Last Sunday, as we were strolling around the mall with hubby, we happened to pass by a furniture shop and had a glimpse of their beautiful furniture designs. Actually, we were really planning then to buy a new Closet and a drawer at the same time for myself. But guess what, we eyed a very nice DINING ROOM FURNITURE instead. Lolz! 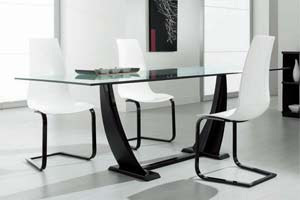 It was a contemporary or shall I say modern dining room table. So amazing, and I believe it is perfect with a simple and beautiful design that will truly gives your furniture and instant enhancement of one’s dining room’s décor. I wish and pray that we could have it so soon or as early as next year.